C&S Antennas manufactures HF wire antennas for short, medium and long range communications. 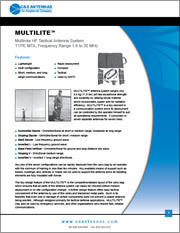 The antennas are designed for tactical, emergency and fast-reaction situations. Wires are Kevlar cored, copper braided and pvc coated with a no-kink feature. 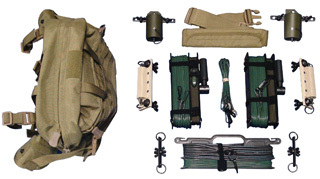 They are numbered for accurate set-up and are designed for the military environment with the solider in mind. 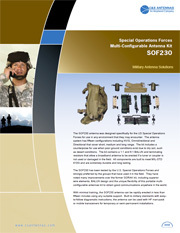 The SOF230 antenna was designed specifically for the US Special Operations Forces for use in any environment that they may encounter. The SF230 antenna system has fifteen configurations including NVIS, Omnidirectional and Directional that cover short, medium and long range. The kit includes a counterpoise for use when poor ground conditions exist due to dry soil, such as desert conditions. The kit contains a 1:1 and 6:1 BALUN and terminating resistors that allow a broadband antenna to be erected if a tuner or coupler is not used or damaged in the field. All components are built to meet MIL-STD 810G and are extremely durable and long lasting. 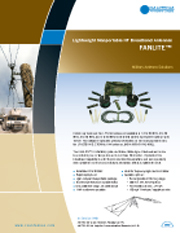 The LFH-230 FANLITE™ antenna is a lightweight, transportable HF wire antenna intended for omnidirectional skywave communications to a range of about 2,000 miles, including short-range Near Vertical Incidence Skywave (NVIS) operation. Supplied in a rapidly assembled kit form, the antenna is designed for use with C&S Antennas’ telescopic CARRYMAST™. When erected on one of these masts, the LFH-230 FANLITE™ may be set-up by two people in less than 25 minutes. 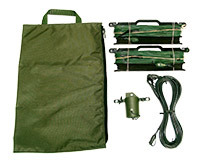 The Longshot™ is a lightweight, transportable HF wire antenna intended primarily for long-range skywave communications. Supplied in a rapidly assembled kit form, the antenna may be erected in a variety of long wire configurations (including a low profile, jam-resistant mode) to meet contingency. The Longshot™ has a 500 Foot Sloping Vee – Long-Range, Transmit/ Receive.